T. Rowe price runs the numbers to find the best benefit claiming strategies for singles, married couples and divorcees. When shoud a retiree start taking Social Security benefits? Hundreds of thousands of dollars are at stake in the answer, and the smartest path depends on a number of factors — perhaps most importantly, marital status. Looking at retirement age and marital status, T. Rowe Price released a study that could help advisors choose the best Social Security strategy for their soon-to-retire clients. 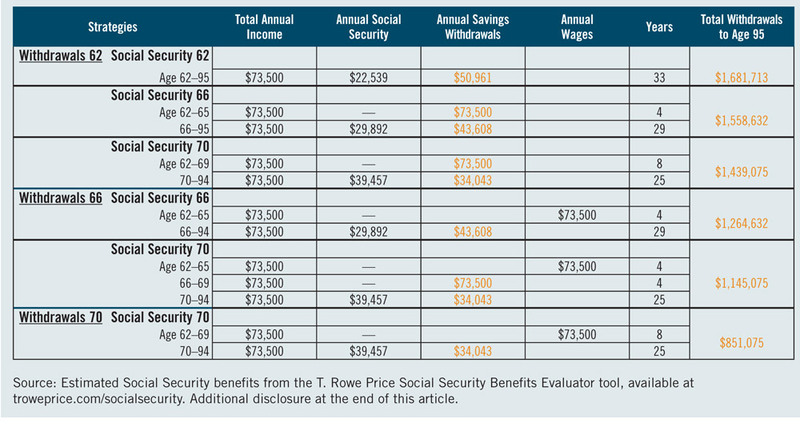 T. Rowe Price used its Social Security Benefits Evaluator tool to examine the trade-off between taking early Social Security benefits and waiting until the latest possible age, 70, while tapping savings in the meantime. Surveys have shown that most Americans don’t understand their options when it comes to claiming Social Security. Retirees have two competing goals: maximizing Social Security benefits, which means delaying benefits to age 70, and minimizing savings withdrawals in the early years of retirement, which means taking benefits as early as possible. Complicating matters, initial Social Security benefits increase by about 8% (plus inflation) for every year recipients can delay benefits from 62 to 70, meaning benefit checks roughly 75% greater at age 70 than 62. And when a client is married or divorced, another set of benefits and withdrawals gets added to the picture. Here, according to T. Rowe price, are the best Social Security claiming strategies for clients who are single, divorced or married. Singles should work full or part time long as possible – at least to 66, if not 70, T. Rowe Price says, in order to delay Social Security benefits and limit savings withdrawals. Retirees who are divorced after at least 10 years of marriage (and a two-year waiting period) can take a spousal benefit, as long as they have not remarried. The divorced could delay their own benefits from 66 to 70 by taking the spousal benefit for four years starting at 66, which would then lower their pre-70 savings withdrawals. The study looked at three strategies for married retirees. First, both partners taking benefits at 62. Of the three strategies, this resulted in the lowest pre-70 savings withdrawals but the lowest lifetime Social Security benefits. At the opposite end, the “maximize” strategy assumed both spouses waited until 70 to start taking their own Social Security benefits and the lower earner started taking spousal benefits at age 66, which resulted in about the same Social Security benefits as the split strategy but more pre-70 savings withdrawals. The married case studies assumed a couple three years apart in age, with the older spouse living to age 83 and the younger to 95.